Today was the first Saturday this season for “Pancakes On The Porch” at Rider’s Hill in Dahlonega, GA. These are not just pancakes, these are HUGE pancakes. These pancakes are the size of a dinner plate! Don’t ask me how they cook them without burning them and flip them without breaking them. Whatever you do, don’t order two. 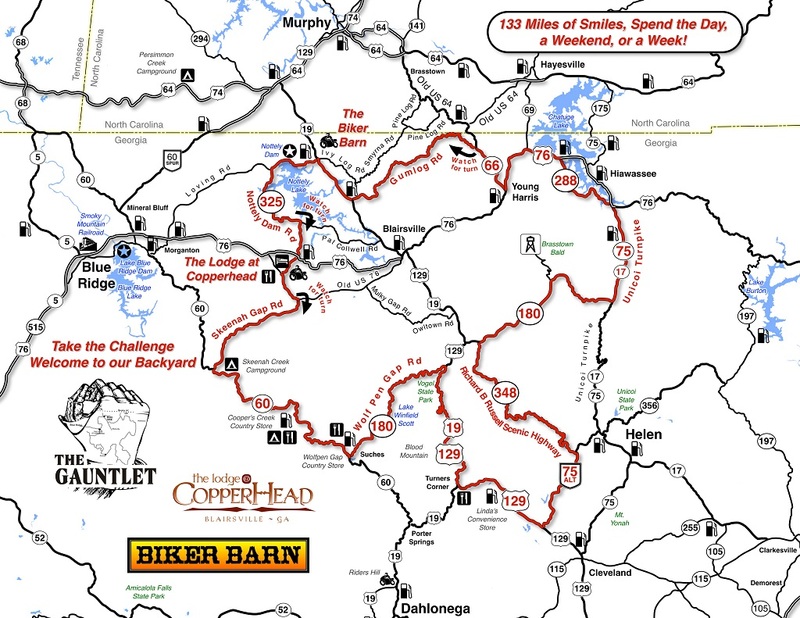 We headed north from Rider’s Hill and took Georgia HWY 60 past the “rock pile” and Two Wheels of Suches. 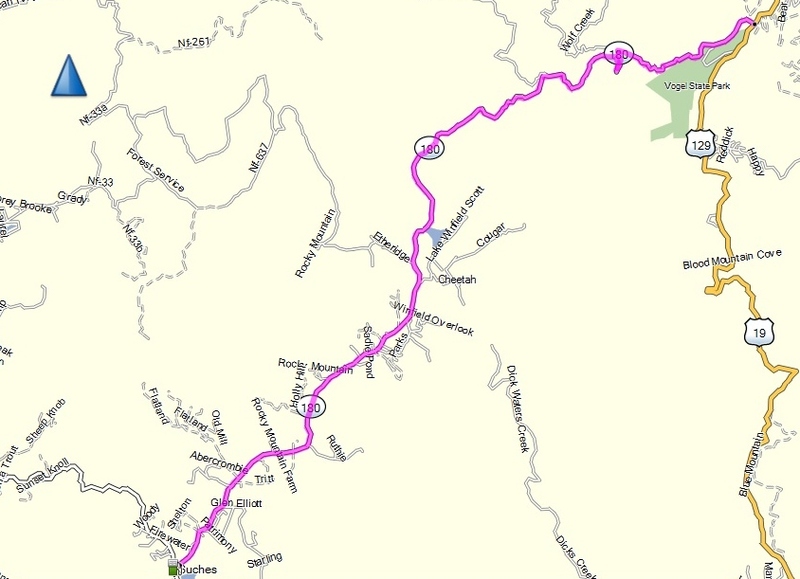 We made the right onto the stretch of Georgia HWY 180 which is named Wolf Pen Gap RD on the stretch between GA HWY 60 and US HWY 129 (the map image below DOES NOT do this road justice). Once at HWY 129 we made the right and then headed up and over Blood Mountain and back for Rider’s Hill. After a short break we headed for home. Down in Dawsonville, they were having “Spring Fling Days” and we wanted to avoid any traffic from that (we got caught in road closures for a foot race on the way up), so after we left Dahlonega we took Georgia HWY 52. While on HWY 52 we saw a sign for a street named Myrtle Beach so in a way, sort of, we rode to Myrtle Beach today. We branched off on Georgia HWY 183 before making the turn on Georgia HWY 53 towards Jasper and then on for home. 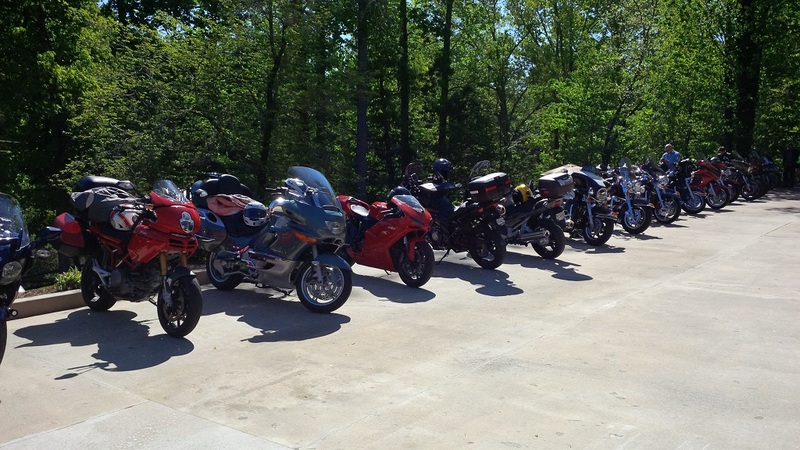 There were a lot of BMW Motorcycle out on the road today as the BMW Motorcycle Club of Georgia was holding its annual Georgia Mountain Rally up in Hiawassee, Georgia. The odometer on the Magic Carpet passed through 81,000 miles today and now sits in the garage plugged into the battery tender with an odometer that reads 81,163 miles. Part of the parking lot at Rider’s Hill this morning for “Pancakes on the Porch”. Wolf Pen Gap RD between Georgia HWY 60 and US HWY 129.